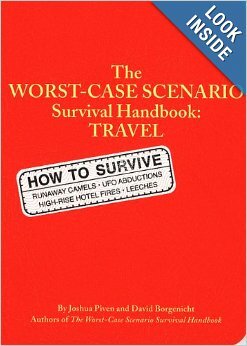 Today in Voice class (open conversation room) I decided to use the “Worst Case Scenario Survival Handbook: Travel” as a conversation starter. The book gives hilarious, illustrated, step-by-step instructions on how to survive travel emergencies such as stopping a runaway camel, jumping from a moving train, and passing a bribe at customs. After showing a few examples, I asked the students to think of a few Japanese emergencies. The winning ideas were losing a train ticket, not having enough money at a restaurant, and missing the last train home. I then got the students to come up with step-by-step instructions on how to deal with these situations. This turned out to be a fun way to teach event sequencing (first do this, next try this, etc) and also some new vocabulary. The students had almost as much fun as I did. Some days I am still surprised that I get paid for this. Remember kids: don’t get off the camel until it stops moving. This entry was posted on February 4, 2014, 8:00 pm and is filed under Kawasaki Nova, Teaching English. You can follow any responses to this entry through RSS 2.0. You can leave a response, or trackback from your own site.